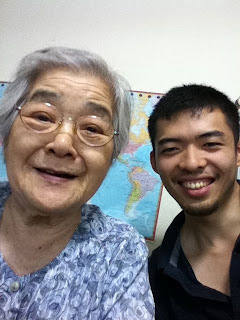 This post was written by Tsuyoshi Domoto, who is volunteering with Unión MicroFinanza and plans to join the team as an intern in Honduras in February. I first came across microfinance when I picked up Muhammad Yunus’ book Banker to the Poor at a bookstore in Los Angeles. I can’t pinpoint what had drawn me to that book out of the thousands in that bookstore. Maybe it was the gold logo on the top right corner of the book, which stated that Muhammad Yunus and the Grameen Bank were co-winners of the Nobel Peace Prize. Or maybe it was my inner soul trying to reconnect with the outside so called “real world,” with which our college community was so out of touch. I was still a freshman in college at the time and I had no clue what I wanted to do with my life, let alone what I was supposed to do for the upcoming summer break! Little did I know then that Yunus’ book would come to define the rest of my college career and potentially the rest of my life. Fast forward several years to November 2011; a colleague and I were having lunch in the Marunouchi business district of downtown Tokyo. It was inside a traditional Japanese izakaya (Japanese style drinking house) located in the basement of an office building. It was because of the conversation that I had with my colleague there that I decided I had to fundamentally change the direction of my life. We were discussing the Japanese virtue of gaman, which he said had two definitions; one was that of patience and endurance, but the other was that of persistence. He then put it in context and laid out a scenario where one would be working hard and enduring gaman all for the sake of gaman. The next scenario was one where he/she would be enduring gaman, except this time for a noble goal, a worthwhile cause. It was a rude awakening for me that I had, until then, mindlessly endured my work just for the sake of it! I had worked in a 9-to-5, or at times a 9-to-9 (or even later), sort of job for the previous year and a half, which was unfulfilling, monotonous and to me, lacking in value. At the end of the day, creating confirmations or financial contracts for derivative transactions isn’t something that you can say is really “changing the world for the better.” I came to the realization that if I was going to endure hardships, face obstacles and surmount challenges, it would be for a cause that I cared deeply about. Enter my grandmother. When people ask me, “Who is your hero?” I usually reply with an embarrassed smile on my face, “it’s my grandmother.” I personally do not know anyone else who has had to endure so much in one lifetime and yet have the spirit to say that she is blessed and that she has no regrets about her life. However, there is one thing that she told me that she wished could have been different…and that was to complete her studies. However, due to the circumstances of the time she was yanked out of third grade so she could learn a trade (sewing) in a distant town to support her family. She was an intelligent woman who loved to learn, and if she had been given the opportunity to fulfill her potential, I wonder what she could have accomplished. Recently, when I was in Japan, I watched her as she studiously worked on a math Kumon worksheet. She had not given up her dream at the age of 90 and her passion for learning was still as strong as ever. I was moved to my core and with it, I came to the realization that it is for people like her for whom I must dedicate my life. My father has always used a relay as a metaphor for life. One generation must pass on the baton to the next in this never-ending race of human civilization. My grandfather was only able to give my father just enough so he could complete his higher education. My father has taken a step further in allowing me to study in the United States as well as travel to countries he himself could only have dreamed of visiting. It is now my turn to pass the baton. In the past, I had pondered if it was my responsibility to put my son or daughter on a space ship and take them to the corners of the universe. I now realize that the answer could be found not far in space, but in reality, right in front of my eyes. The baton needs to be passed not only to my children, but also to children around the world; some, like my grandmother, are yearning to go to and finish school, yet do not have the resources or the opportunities to do so. My responsibility is to help them have an equal chance in this race, in this relay, so they can stand on the starting line just as my own children will one day. This is where microfinance returns to the picture. Microfinance is a tool that is, despite its imperfections, the best we have in eliminating poverty. It allows people who have been deprived of an equal opportunity to stand side-by-side with others at the starting line. It is not a hand out, but a hand up. This firm belief in the power of microfinance and a strong sense of responsibility is what has led me to my decision to move to La Unión, Honduras, to work with UMF and its team. Uncle Ben from Spiderman summed it up best when he said, “With great power, comes great responsibility.” I am no Spiderman and I have a lot to learn, but I hope I will be able to make a positive difference in the lives of the Honduran people during my time there. Celebrate Thanksgiving this year with a new recipe or two -- that involve coffee. Coffee enriches the taste of many foods, not only desserts. Below are a few recipe ideas to get you started; you can share your own favorite recipes in the comments, or let us know how these turned out for you. We recommend using some freshly roasted Honduran coffee, which also serves as a perfect follow-up to post-turkey-coma. 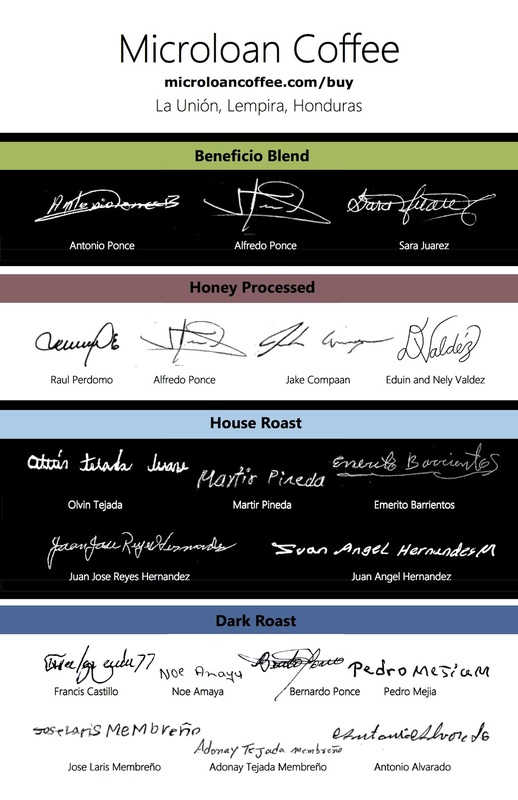 You can support farmers in La Unión by purchasing coffee here, where you can find our beneficio blend, and coming soon, our new honey processed coffee. Baked beans, flavored with coffee, molasses and brandy. Add espresso to traditional pumpkin pie. Serve turkey with a coffee barbecue sauce. For a different meat, try lamb in coffee sauce. Enhance beef stew with coffee. It’s never too cold for coffee ice cream. Need more ideas? This website has 14 coffee-based recipes for you to try. What is your favorite coffee recipe? The first time I saw Noe Amaya, I was a little distracted. I had just taken my first ride on the back of a motorcycle through the mountains of La Unión. Our Field Officer Gilberto brought me to the village of Nueva Paz to help examine pilas, large cement water cisterns, in various homes in the community. We were embarking on a community partnership project there, where a clean, fresh source of water was hours away. A motorcycle ride through the mountains of western Honduras is the most breathtakingly beautiful experience. For a good hour or so afterwards it’s hard to snap out of the dreamy reverie it inspires. Noe, however, snapped me out of it right away. He was too expressive and too energetic to ignore. 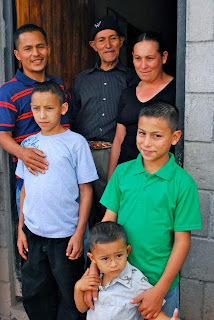 In many ways, Noe is the leader of Nueva Paz, a village that participates in our microloan program. He regularly lends his knowledge of construction, coffee, or various other skills to community members who need it. People stop by his house often, asking for advice or looking for a connection to some resource or person. Noe is the man to advise, to connect people, to lead. 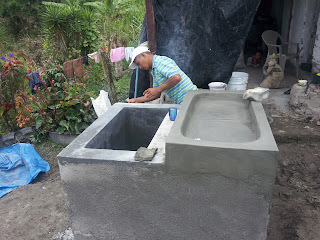 He had already built a pila in his own home, but he lent his knowledge to build pilas in other homes during the community partnership project. In typical Noe fashion, he offered his help in any way, and then ended up coordinating and leading most of the work. Noe isn’t from La Unión. He’s from the state of Atlantida along the northern coast of the country, which makes his role as a leader in the insular community of Nueva Paz that much more impressive. He has a small coffee farm, or finca, that measures around 1.2 acres. 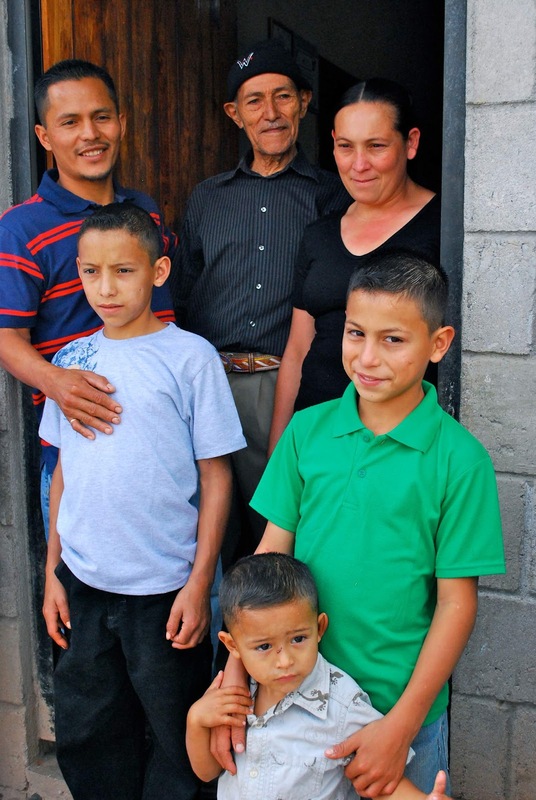 His wife and three young sons help maintain and harvest his finca, making it truly a family affair. Noe cultivates his own field in addition to picking coffee on larger farms during the harvest, working on bean or corn farms, and taking on any construction job or odd job he can. Due to his unceasing energy, he turns this eclectic mix of exhausting work into a livelihood for himself and his entire family. His passion, however, is his coffee field. From his small field he managed to grow a great coffee; his beans contribute to our Dark Roast. When you talk to Noe, you understand why he’s reaping great things from a tiny stretch of land. The word calidad - quality - threads through his conversation about coffee. “That’s my plan, growing a coffee of calidad...you can’t grow coffee without caring about its calidad...the goal of utilizing UMF’s resources is to increase the calidad of my coffee.” Because of this, I love listening to Noe talk about his coffee. He thinks critically about his harvest. He has a vision for his coffee - one of a specialty-grade product, one where the bottom line isn’t necessarily the money he can make from his harvest but rather the name he can make for himself as a producer of coffee. This combination of energy and vision makes me excited to follow Noe’s future as a coffee producer. Noe leads construction on a pila. The last time I saw Noe Amaya, he was shouting over a thunderstorm pounding against his tin roof. It was about six months after first meeting the Amaya family, and I had come back to Nueva Paz with another UMF Field Officer, Martir. We were visiting friends in the community when the thunderstorm made any chance of driving our motorcycle down the muddy roads too dangerous to attempt. Noe, of course, offered to let us stay with his family until the storm cleared. His wife Mirna served us cups of coffee and plates of tamales, and we chatted about life. Noe talked about his plans for his field, for the success of his community, and the need to take ownership of the circumstances we’re born into. I sat there for a long time, soaking up his wisdom, nodding at Mirna’s clever interjections, and playing with their youngest son. I felt honored that UMF was connected to this family. Eventually the storm cleared, and Martir went to grab the motorcycle. I should have been excited because the sun had set and we were going to drive through the Honduran mountains under the stars. But I wanted to stay, to keep talking about life and gleaning all the warmth and wisdom I could from Noe and Mirna. I realized that I had finally found something even more beautiful than a mountain moto ride under the stars, something I had thought impossible until meeting the Amaya family. Unión MicroFinanza has begun improvements on its beneficio in advance of this year’s coffee harvest. These additions will increase the quality of the coffee processed at the beneficio, which will give farmers a higher price for their coffee. But these changes will not only improve coffee processed here; they will also serve as examples for farmers who process their own coffee, so they may see how to make improvements on their facilities. As with everything that we do at the beneficio, all of the changes are designed to be easily replicable by farmers in the area. We also want to constantly reduce the environmental impact of processing coffee, and many of these changes will help us reduce our environmental impact. This is an introduction to the improvements we will be making this year, but watch this blog throughout the coming months as we explain each in more detail and provide photos of the construction. · Receiving tank improvements – We will be moving receiving tanks and redesigning them to make it possible to receive, sort, and move coffee with much less water usage. · Mechanisms to sort green and partially pulped cherries – These sorters will help ensure that any coffee that is damaged or not fully developed will be separated from good coffee. · A biosand water filter for water to be used in processing – This filter will ensure that all water used for fermenting, washing, and sorting coffee will be of the highest quality. · Construction of two additional solar dryers – These solar dryers will help increase the capacity of processing, since drying was our largest bottleneck last year. process more coffee at a given time. · A roof over the beneficio – It’s no fun processing coffee without a roof over your head when it is 50 degrees and raining. The roof will also help keep direct sunlight or rain from falling on fermenting coffee, thereby increasing quality. · Tiles in the fermentation tanks – These tiles will make it easier to keep fermentation tanks cleaner, which will increase quality. · New drainage tubes in the fermentation tanks – These drainage tubes will facilitate easier and more complete washing of coffees after the fermentation process. · Improvements on the road leading to the beneficio – We want to ensure that any car/horse/person can get into the beneficio, and the road improvements will facilitate this access. · An overflow valve for the water tank to prevent flooding – Large amounts of rain previously caused our water storage tank to overflow. This valve will send excess water into our water treatment channels, where it can be recycled for future use. · A drainage system in the vermiculture – This will allow us to catch runoff from coffee pulp, which can be recycled as organic pesticide and fertilizer. · Paint for the correteo – This will help us keep the correteo sorting mechanism cleaner, and will protect the cement from sun damage. · Water treatment and water system improvements – These improvements will help us to effectively treat coffee processing water to avoid environmental contamination. We are very excited to start receiving this year’s harvest at the beneficio, and we hope that through these coming blog posts, you will learn more about coffee production, the environment, and coffee farmers in Honduras. This past coffee harvest, UMF made its first steps toward producing an organic fertilizer from coffee pulp. Turning the fruit of the coffee cherry that encases the bean into an organic fertilizer helps us promote environmental and economic sustainability in coffee production. To give an idea of the importance of this, every kilogram of untreated coffee pulp contaminates the environment as much as a day’s worth of human excrement. It has been several months since we began treating coffee pulp from our processing plant, and we are excited to say that the fertilizer is ready to be applied. We spread the pulp, gave it a few weeks for initial decomposition (when the temperature of the pulp and moisture content can be harmful to worms), and then added a bunch of California Red Worms, provided to us by IHCAFE. These worms eat and digest the coffee pulp, slowly breaking it down. We sprayed the coffee pulp with BioAG, a commercially available, certified organic product of enzymes and micro-organisms. This product breaks down the pulp through a mixture of yeasts, sugars, and bacteria that digest the pulp. With the same goal as commercial products, the home-made organic product is made using bacteria and micro-organisms found in coffee farms and then cultivated. Gilberto and Martir take samples for soil analysis. Each product has advantages and disadvantages. The vermiculture is relatively inexpensive (the only input is worms, which are readily available for free from a variety of sources) but requires close attention to maintain proper moisture levels. BioAG is the easiest of the three solutions, requiring only one application and no further care, but is relatively expensive. And the home-made organic product is very inexpensive, but requires a large amount of up-front work to prepare and replicate micro-organisms. It also requires a series of applications and works more slowly than BioAG or the vermiculture. We took samples from each of the three trials and prepared them for soil analysis. These samples are on their way to the IHCAFE soil analysis lab where the three trials will be tested for macronutrients, micronutrients, and soil structure. Once we have these results, we will be able to compare ease of use, cost, and quality of organic fertilizer produced by each of the three methods. with UMF, USAID and UMA. We are the first organization in the area to run a trial of a variety of forms of organic fertilizer production. This means that once we get soil samples back from the lab, we will be able to give informed advice to hundreds of farmers on how to best convert toxic coffee pulp into beneficial organic fertilizer. We have already hosted a training session for farmers to show the different ways of producing organic fertilizer from coffee pulp. We will post results from the soil analysis when they come back (generally 30-60 days), and we are excited to begin preparation for this year’s coffee harvest, when we plan to expand practical trials and research in coffee production. This will allow us to better assist farmers as they strive for better quality and environmental sustainability. The community of San Carlos celebrates the water system. Strings of balloons hang from the dense branches of an old tree, shading the people of San Carlos as they listen to speeches by representatives of the community, municipality, schools and churches. Down the road from the gathering, an electric pump pulls water from deep underground and sends it to a storage tank that sits on a hill overlooking the village. From this tank, clean water flows through a pipe system to serve each home in San Carlos, a village of La Unión. This is the reason for the balloons. On Sept. 29, San Carlos inaugurated its water system, a project that was completed as a partnership among Unión MicroFinanza (UMF), Medical, Education, Training and Development, Inc. (METAD) and the community of San Carlos. The system gives consistent water access to the people of San Carlos, who previously used a hose to gather surface water that was often only available during rainy season. This was reason enough to celebrate. But this project will also improve health: the surface water on which the village previously relied was contaminated by sewage, coffee processing waste water, and chemical runoff from nearby farms. This is the first potable water system in the villages surrounding La Unión. Tonito Ponce enjoys clean water from an underground well. With training and financial resources from METAD, UMF helped direct the project from initial assessments by a water engineer to the finishing touches on the system. The village of San Carlos created a committee to ensure that the community was involved in decision-making from the start of the project, and they worked closely with UMF and METAD. The water committee is also responsible for system maintenance and continued education in the village about clean water use, hygiene and sanitation. The speakers at the inauguration celebrated the benefits of a water system for the community, but one could see the benefits firsthand by walking to a nearby spout and filling up a glass of crystal-clear water. The community of San Carlos, METAD, UMF and the municipality of La Unión.